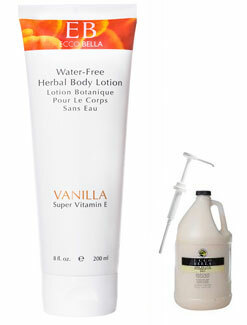 Ecco Bella's Vanilla Lotion is one of the most rich and luxurious body creams with a true French Vanilla scent to delight your skin and senses. It is a 100% water-free body treatment that is long lasting without being greasy. It relieves even the most dry skin and makes an incredibly luxurious massage cream with a scent that is opulent and long lasting making you smell heavenly. Research has shown that men are particularly drawn to the scent of vanilla (see our pheromone article for more information) and that is why it is such a popular scent. However, often vanilla scented products miss the mark on a truly extravagant and natural smelling vanilla whereas, Ecco Bella Vanilla Lotion has absolutely captured it in this lovely cream. This is why it is such a longtime best seller and why we offer it in a gallon size in addition to out 8 oz. version. We include the pump for the gallon size. Organic aloe barbadensis leaf, sunflower seed oil (helianthus annuus), coconut oil (cocos nucifera), safflower oil (carthamus tinctorius), sesame oil (sesamum Indicum), glyceryl stearate, glyceryl stearate citrate, cetyl alcohol, glyceryl oleate, stearic acid, glyceryl caprylate (vegetable derived emulsifiers), xanthan gum, glycerine, babassu oil, sodium phytate, organic extracts of calendula (officinalis) chamomile (matricaria), tocopherol (1700 iu vitamin E from soy), retinyl palmitate (450,000 iu vitamin A), vanilla fragrance, vanilla (plantifolia) extract.